Meter Fuse (Fuse#11) on fuse panel located on left side of dash keeps blowing as soon as the ignition switch is turned on and vehicle won't start with fuse blown? Unplug the back-up light switch on the passenger side of the transmission. Will the fuse blow still? This vehicle is a manual correct? No, this vehicle is an automatic. Also, the vehicle started this morning. We were driving down the road when the fuse first blew. All-of-a-sudden the speedometer and tachometer and all gauges died, (went to zero), all dash warning lights flashed and went dead, and transmittion would not advance and shift to next gear. Pulled of the road, parked and shut engine off. Went to retart engine and notice first click on ignition did nothing, when normally first click lights up all waning lights and engages gauges. Turned ingition further to start and nothing. Checked all fuses on interior fuse panel, dash fuse panel located on left side of dash, left of steering column, and found fuse titled "Meter" blown. All other fuses were good. Replaced "Meter" fuse, which is numbered 11 on fuse block, with new correct amperage fuse, 10 amp, turned key and "Meter" fuse blew as soon as I tried to start the engine. Replaced fuse again tried to start vehicle and pop, Meter fuse blew again. Repeated this three times and fuse titled "Meter" keeps blowing. All other fuses remain good. I will opt out so another expert can help while I look into this. Experience: Nissan factory trained and Certified Subaru Technician. Greetings Sir or Madam and welcome to JA! I will do my very best to assist you with your problem. Hi, this is Tom. It is a 1995 Nissan Pathfinder XE V6 4x4 with the 3.0 Liter engine and is automatic transmission. 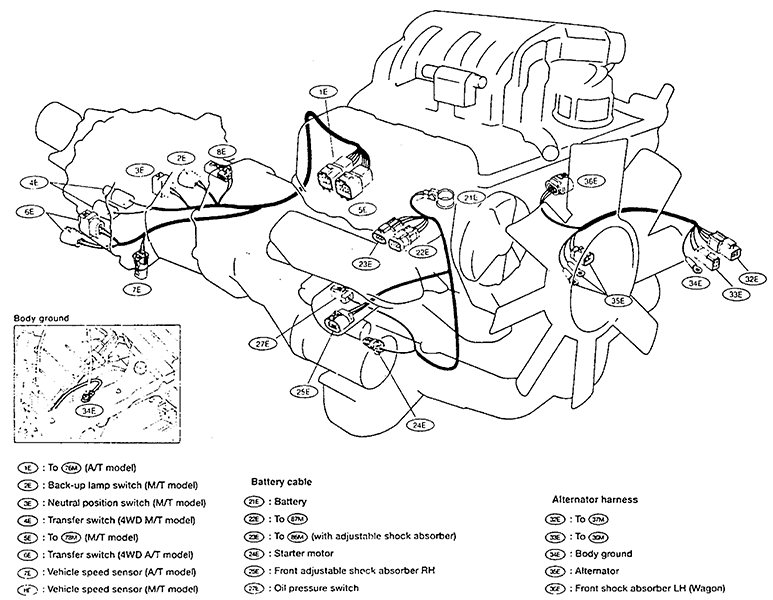 Ok, Normally what we see with this is the wiring for the vehicle speed sensor is rubbing the transmission. This causes the short an pops the meter fuse. Start at the tail shaft and follow the wiring,it is normally where it goes over the bell housing for the transmission and tough to see of course. This will affect the shift pattern of the transmission because the speed sensor is one of the inputs for it to know what gear to be in. Thanks carguy1. But would it keep blowing the meter fuse as soon as you turn the key on. The fuse blows immediately upon turning the key, it won't even start, much less sense any speed. Well, thing is, here is a list of everything riding on that fuse. I am just telling you what we normally see. With this list however, you may be able to unplug things and then plug them back in one at a time until it blows.This will at least get you to the circuit. I believe you have power to the speed sensor right off the bat. Excellent carguy1. I'm in the process of having the Pathfinder towed to my home. It's about ten miles away. As soon as it arrives, we'll trace the wiring for the Speed Sensor to see if it's shorting against the transmission, or rubbing/shorting anywhere for that matter. One last follow up question...from the list of all the different circuits that you said are on that one 10 amp fuse, seems like a lot for a single 10 amp fuse, but I guess that's Nissan, (i) are you sure that's all that's on that one Meter fuse, and (ii) if so, if any one of them had a short, would it blow the fuse as soon as you turn the key, (i.e. if the cruise control was not turned on, would it blow the fuse when you truned the key. Or if the radio and power antenna were'nt on would it blow the fuse when key is turned. Back up light would'nt be on, the vehicle is in park when turning the key, window defogger not on, etc...Is there any one circuit or circuits on the list that you know of would be hot as soon as you turn the key? I suspect it will be the speed sensor or the instrument cluster itself. These have a printed circuit board on the back of the cluster and sometimes it comes loose.Or the screws that hold the speedometer head on come loose. I would start with the speed sensor, then I would unplug the instrument panel. 2011 nissan cube, heater or ac wont turn on or blow air. 2006 nissan mutant won't start after trying to charge a.c.